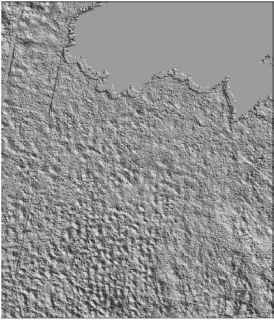 These are probably the most common drumlins and their explanation is relatively uncomplicated. Each drumlin is a residual ridge left upstanding as the surrounding countryside is scoured (Fig. 4.5). The important problem here is to explain the preferential scour: it corresponds to erosion by horseshoe vortices (Fig. 4.5). Obstacle (drumlin) formation is self-perpetuating because the obstacle itself sets up the vortices. High Reynolds numbers are required because the extension of the vortices down-flow requires high inertial forces in the fluid. In the early stages of formation of these drumlins, hairpin troughs define the ridges. In more mature forms, these troughs are not so prevalent because the ridges become streamlined (Shaw, 1996). Figure 4.5 illustrates these points for drumlins, for hairpin scours in bedrock and for a model of the erosional processes and kinematics of horseshoe vortices. Tunnel channels, marking the passage from sheet flow to channelized flow, dissect extensive fields of these drumlins. Note that the configuration of the Kelleys Island scours and the drumlins are very similar (Fig. 4.5).